Necessity (read: HEAPS of FABRIC) has led me to design a lot of quilts. You know the drill–I see fabric, I want fabric, so I have to design something to use fabric. Originally I designed my own quilts because I didn’t know where to buy patterns (DUH, but then it was a looooong time ago). Now I just don’t like following a pattern. 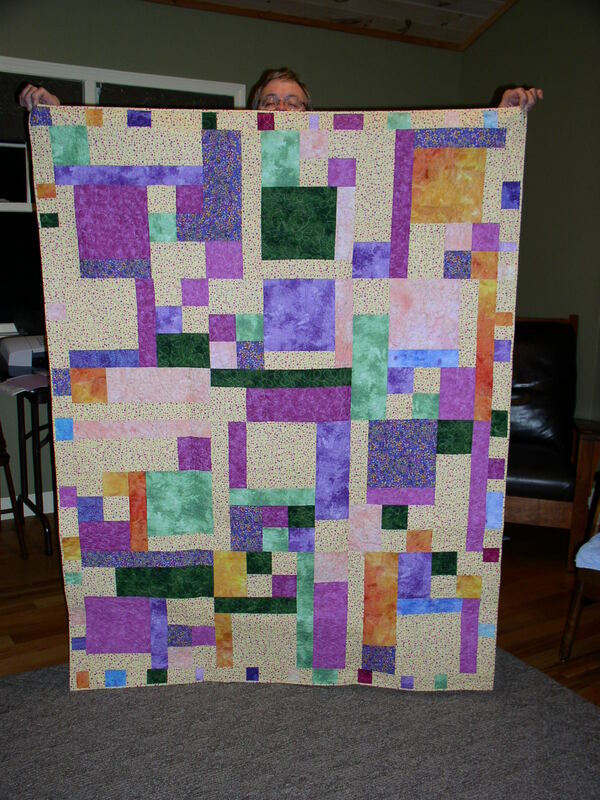 Recently I’ve been working on a series of quilts made from strip sets. 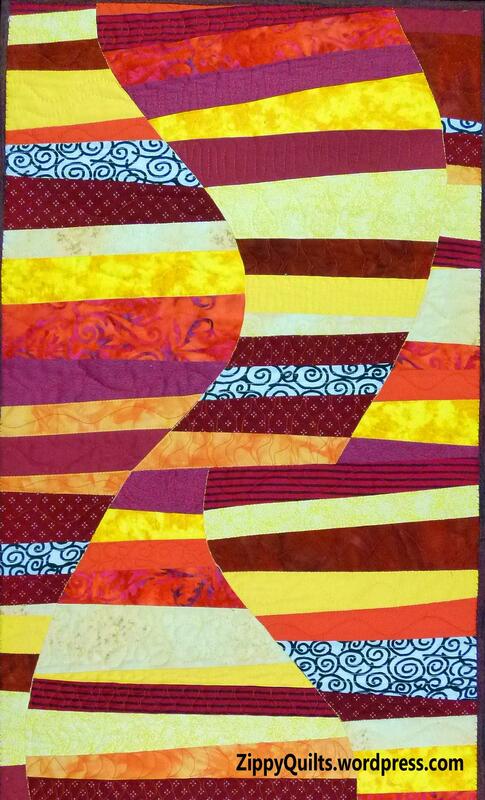 I make up several strip sets in the colors I want for the mood of the quilt, then cut freehand curves in them and sew up a quilt top. Here are a few little practice pieces (Weeks Ringle calls them “maquettes”, but I’m not sure I’m that fancy). The larger one at the top of the post is the one I have in this year’s Asheville Quilt Show, which is the first big show I’ve entered. I’m fortunate to live (sort of) near Asheville (NC), where the local quilt guild is full of accomplished quilters. They put on a terrific show every year. I’ve attended the show many times and it’s always impressive. 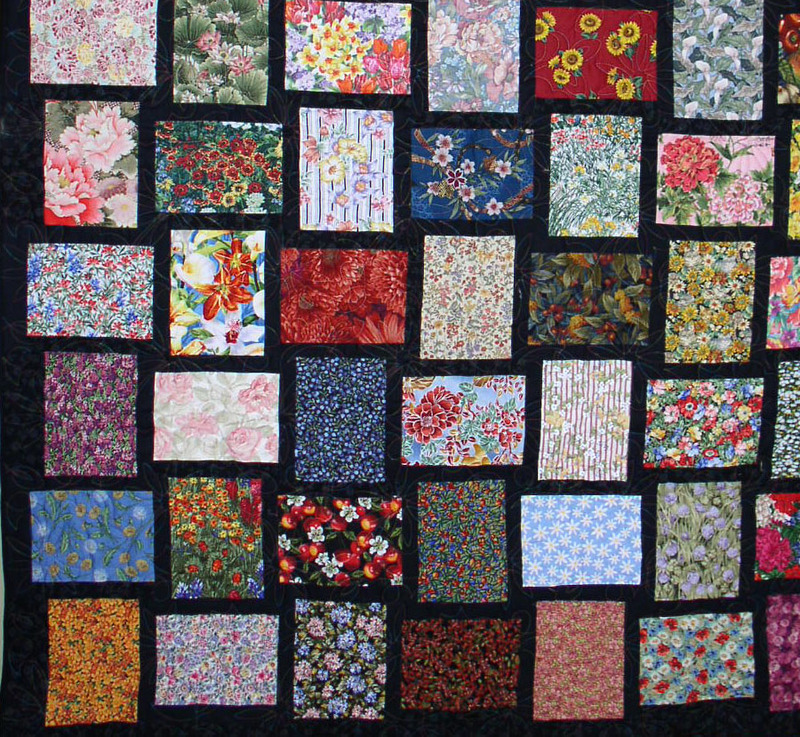 In fact, I like it better than a lot of the big national shows because there is more variety in the quilts. Often the national shows are heavily loaded with the big-deal-of-the-moment, like glued-on crystals, or extra-dense quilting—whatever. The Asheville show typically has a little of everything. Since the Asheville Quilt Guild has a great show, I always assumed it was juried. I decided to submit something anyway. Only to find out it isn’t juried, so my quilt just automatically gets to hang with all those spectacular things made by other people! I’m going to the show today, and it will be fun. Several years’ worth of inspiration in one afternoon—wish you were here! I made a bunch of blocks for a baby quilt, but when I saw them all together they were JUST TOO MUCH! So I separated them with a plain yellow sashing and border, and they worked fine. But wait! There are still blocks left! 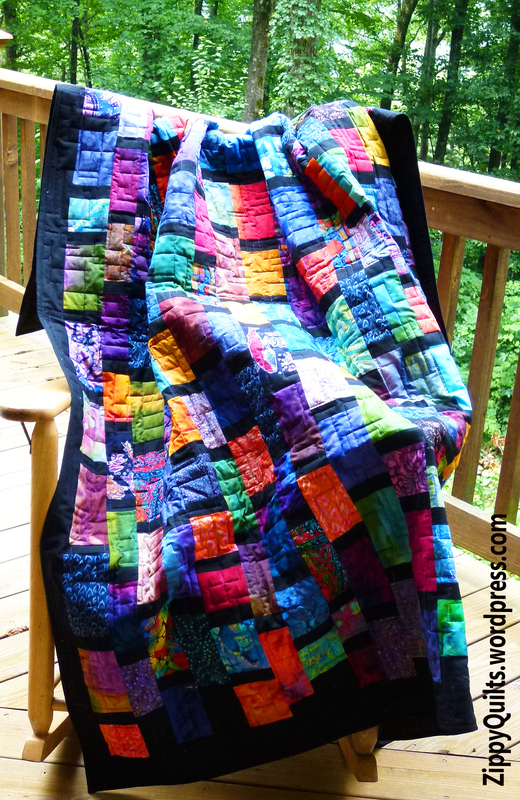 And I really, really, don’t want to do another quilt with plain sashing–boooring! When I finish a quilt, I cut the scraps into strips of set widths (1-1/2 inches, 2 inches, etc) and store them in containers by width. Then when I need a piece for something, it’s often right there waiting. So off to the scrap bins I went. This was a lot more fun than plain sashing, so I may never make plain sashing again. I put together units of 4 blocks then joined them to other 4-block units the same size to keep everything even. 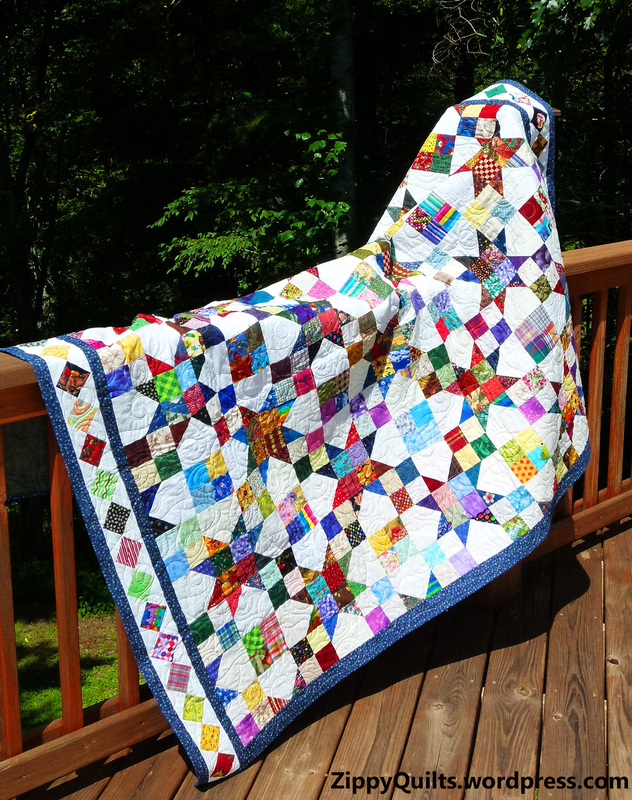 It used up scraps, it got the quilt put together, and it was totally improvisational. 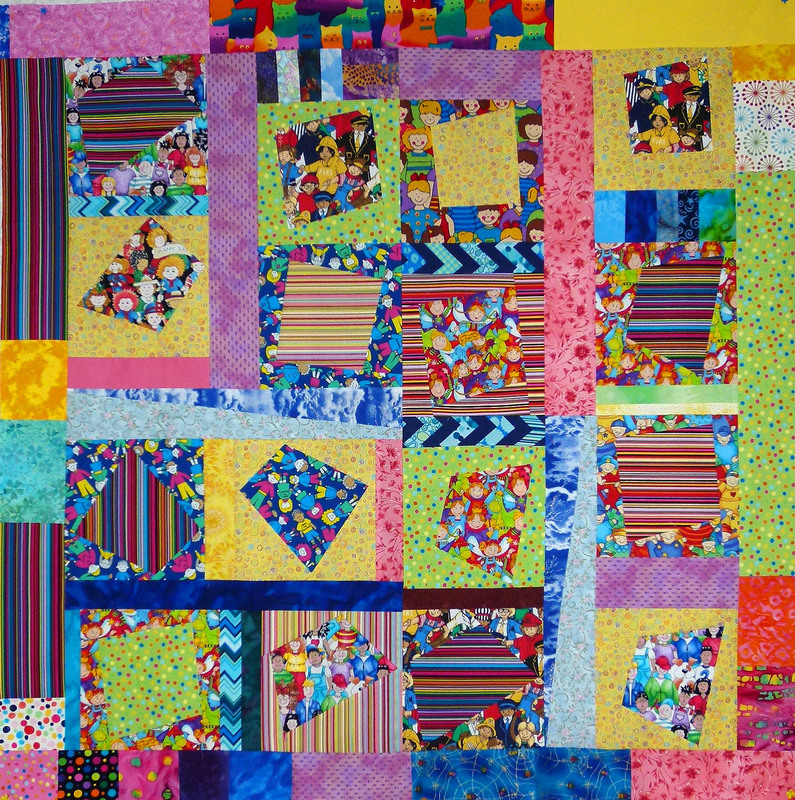 A section of the quilt, showing various sashing–don’t line anything up! 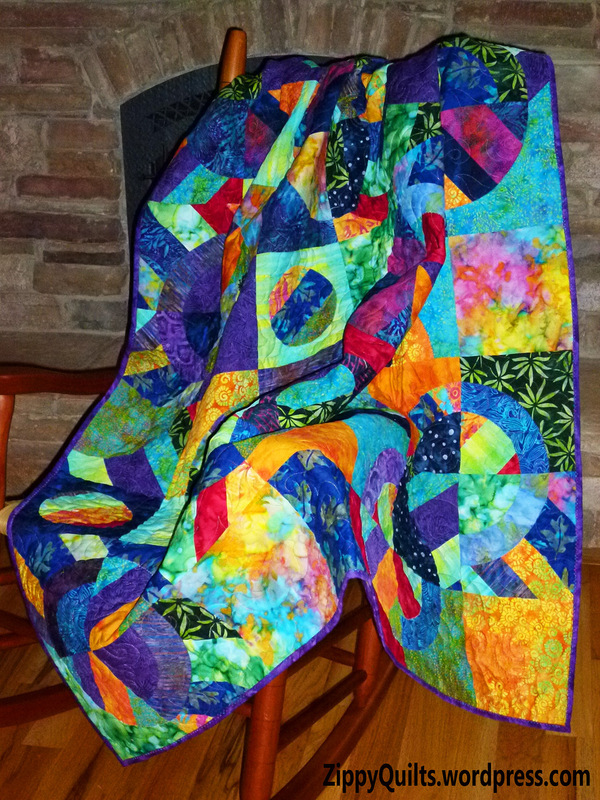 .When I finished the quilt top, I liked it a lot better than the one with plain sashing. The finished top with scrappy sashing and border. Both are donation quilts, about 40 inches square.. Best of all, I learned something making these! So, if you have some blocks that just aren’t working, try scrappy sashing and a scrappy border. Most of all, have fun! A straight-on picture of a quilt is great if you need to see the whole design, but I’m aiming for quilt photos with personality. Here are a few first attempts. 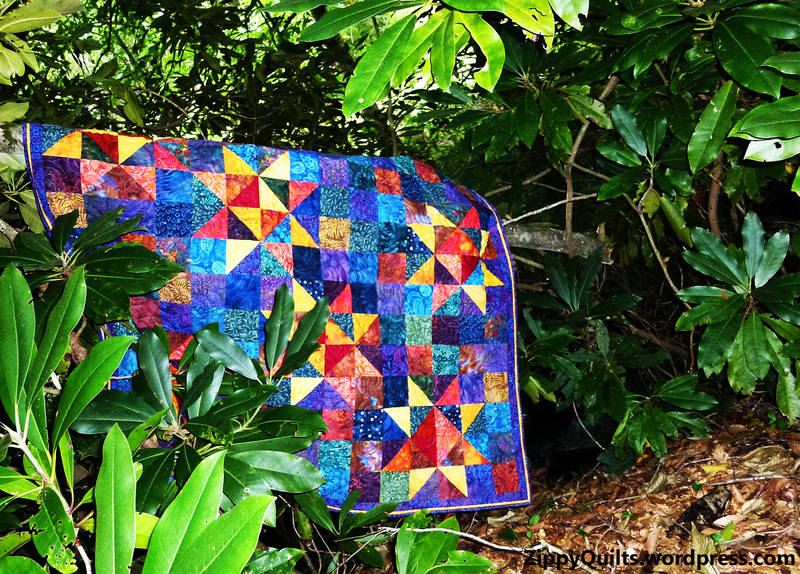 I live in a beautiful part of the country (I’ve said that about every place I’ve lived) so there should be lots of photo ops for my quilts. I also live in the woods, which limits opportunities at my house. Luckily, some friendly neighbors let me borrow their setting for a few of these shots. One thing I found out right away is that full sun washes out the colors in a photo. I need your help! 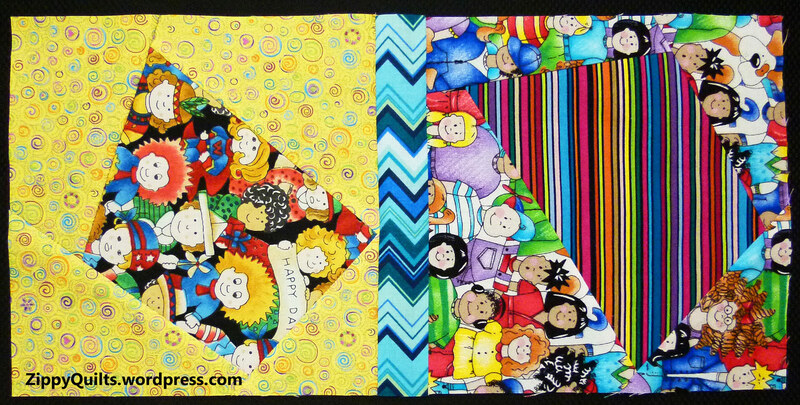 Which of these quilt portraits sets the best mood for the quilt? 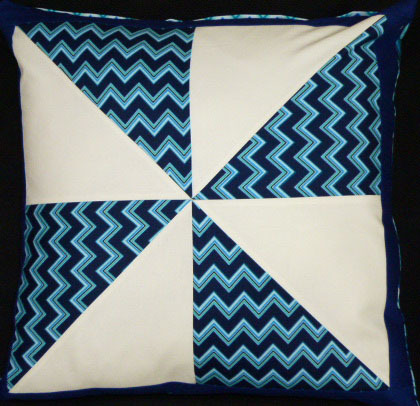 Which makes you say, “I MUST have that quilt!” so you would be tempted to make it, buy the pattern, buy the quilt, ask me to give you the quilt for your birthday (I KNOW who you are)? And why? Please comment! If you’ve never commented on a blog post, here’s how: Folks who get the post by e-mail need to click on the title of the post and that will take you to the blog online. Online, you’ll see a dialog bubble next to the title, like the bubble that appears over the head of a cartoon character. Click on that and you’ll be taken to a screen where you can type your comment. Thanks for your help! #5: I love concentric squares! This is similar to the Hip To Be Square pattern. So, this is what a typical picture of one of my quilts has looked like in the past: Yes, that’s my husband’s head, and the edge of the rug in the TV room…well, you get the idea. And in fairness, most of these pictures were taken years before I ever thought of having a blog and publishing them. Let’s just say they’re less than perfect! Since I started the blog, I’ve tried to improve the old pictures with editing software. 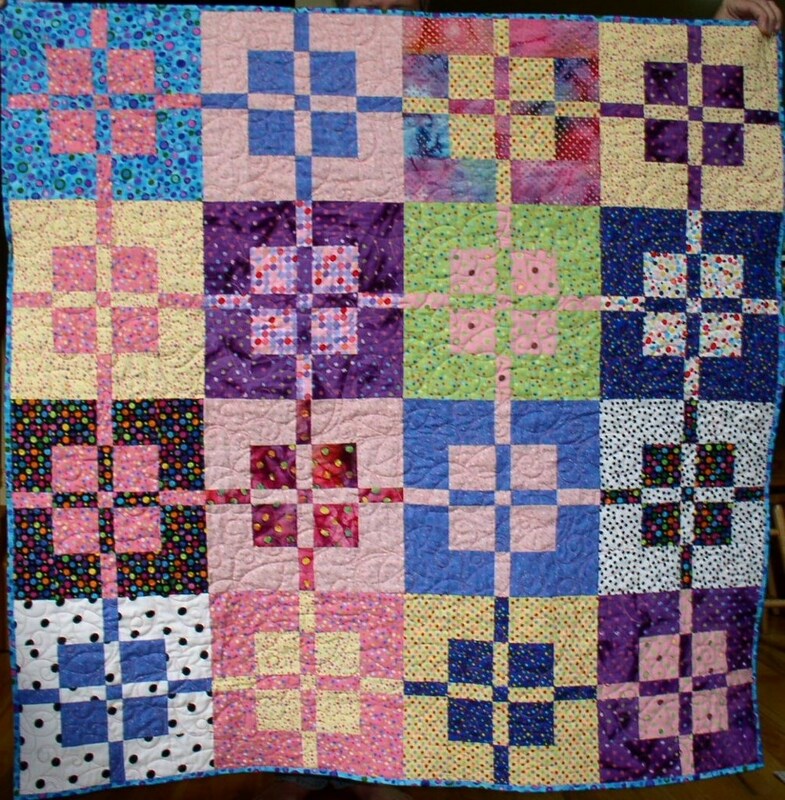 Most of the quilts are long gone to friends, customers, or both, so I don’t have the originals to make new photographs. 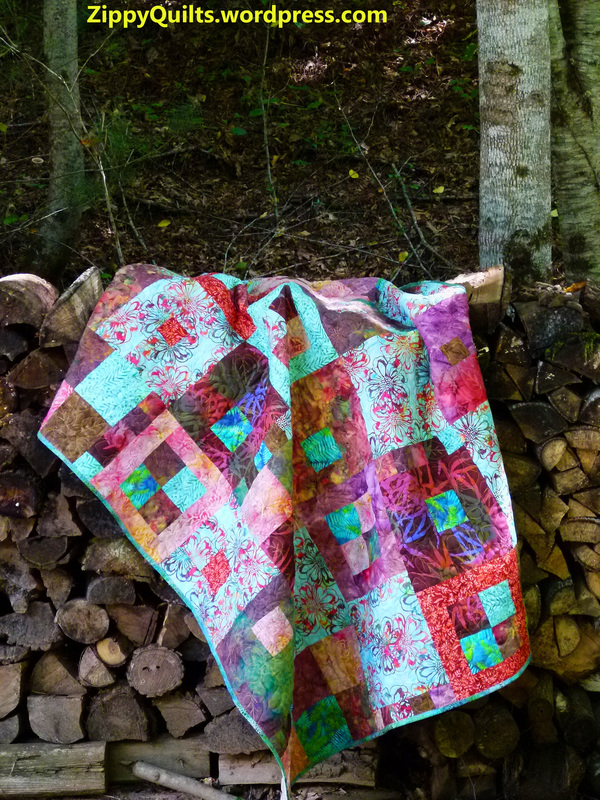 After photo editing, the quilts were a bit easier to see, but the photos still weren’t exactly professional looking! See below. 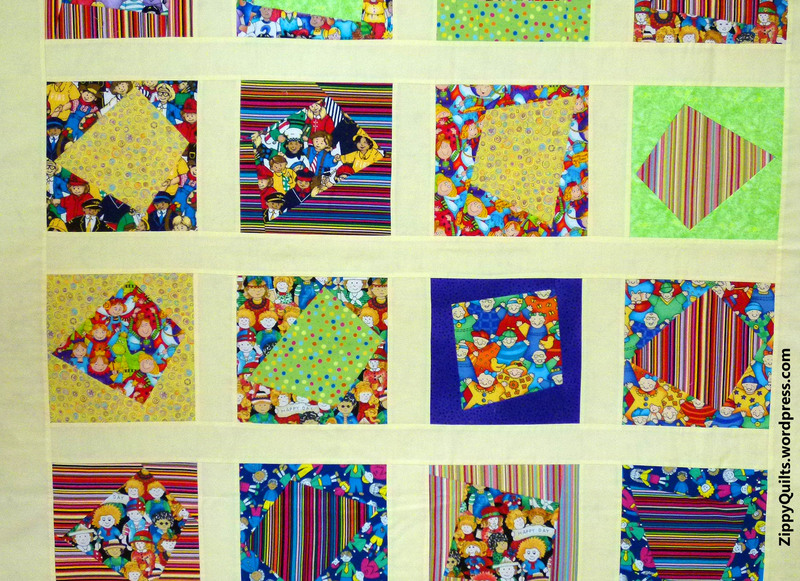 I looked at a LOT of quilt pics on Flickr; most weren’t any better than mine. I looked at books and catalogs. 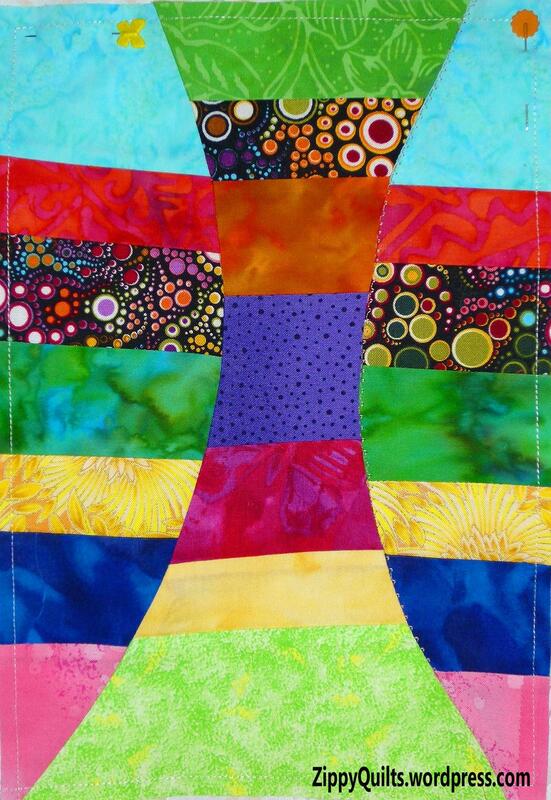 The best quilt portraits I found were in the Keepsake Quilting catalog. They showed the quilts in nice settings, not just a straight-on picture of the quilt. 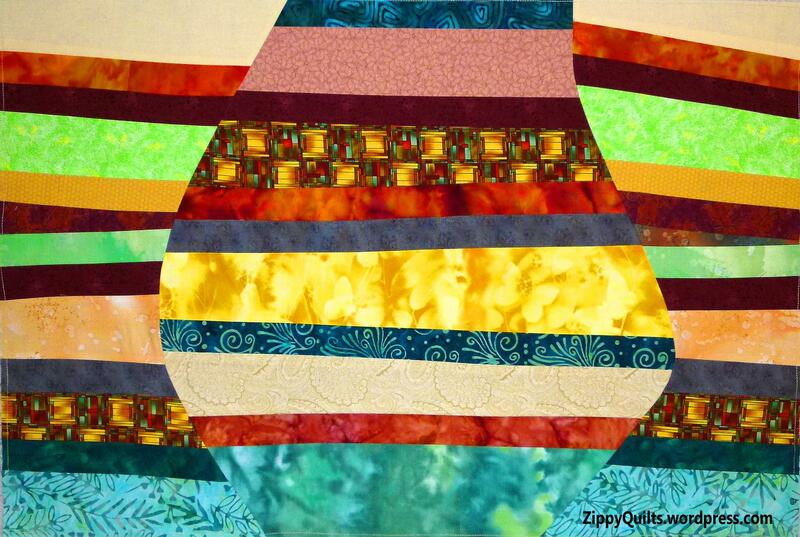 I like this approach because it shows the mood of the quilt, not just the design. I started trying to make better “quilt portraits”, showing more than just a straight-on shot of the quilt. I’ve found that a picture taken with the recipient is very nice. 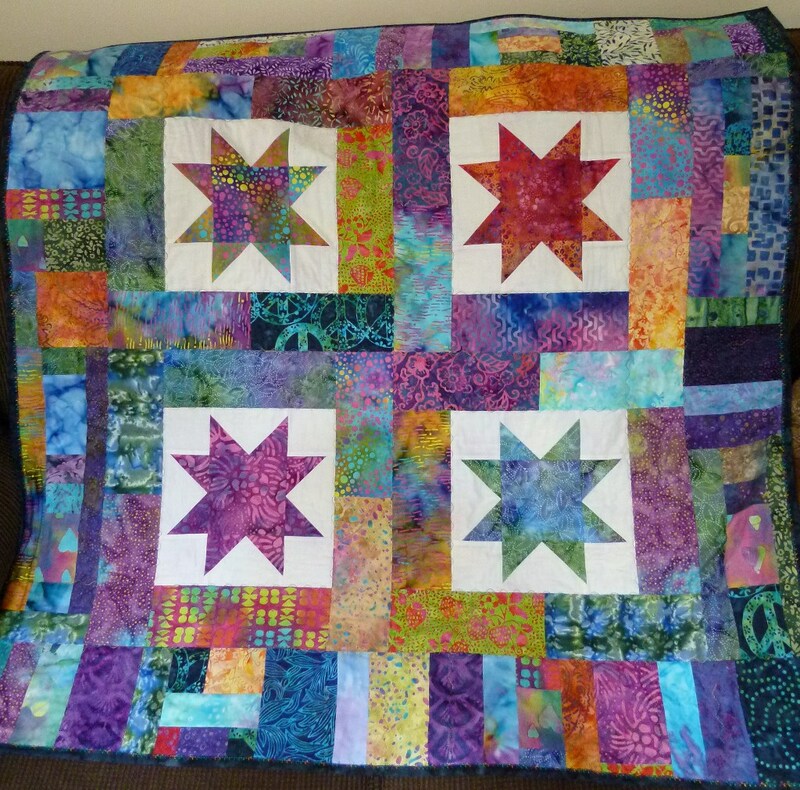 This next picture was sent to me by a friend who bought one of my quilts as a gift. 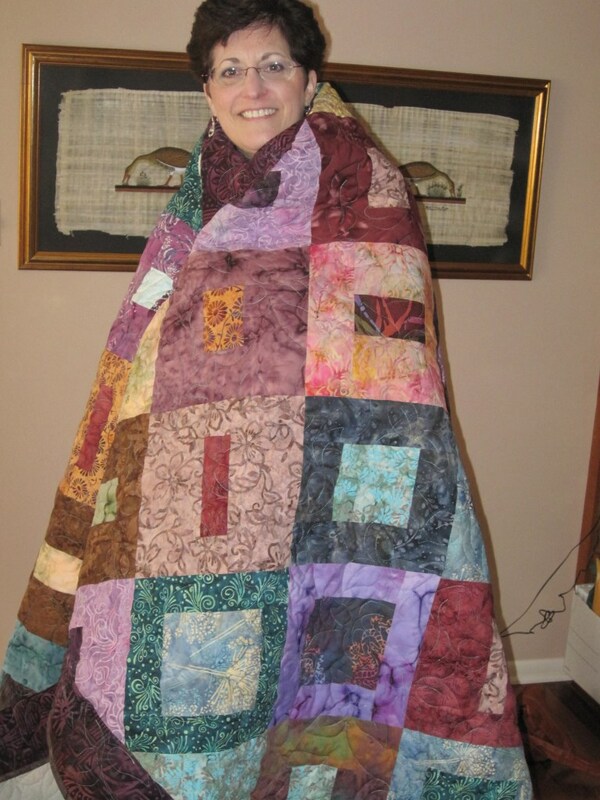 Although it is clearly a snapshot rather than a professional photo, I think it does a nice job of being a portrait of the quilt (and the recipient). It has personality, which is lacking in the straight-on shots even if they show the whole quilt better. I’m off to make some quilt portraits of my own, having learned a thing or two that I hope will improve the shots for my blog. Check back next week and see what you think of my “quilt portraits”. 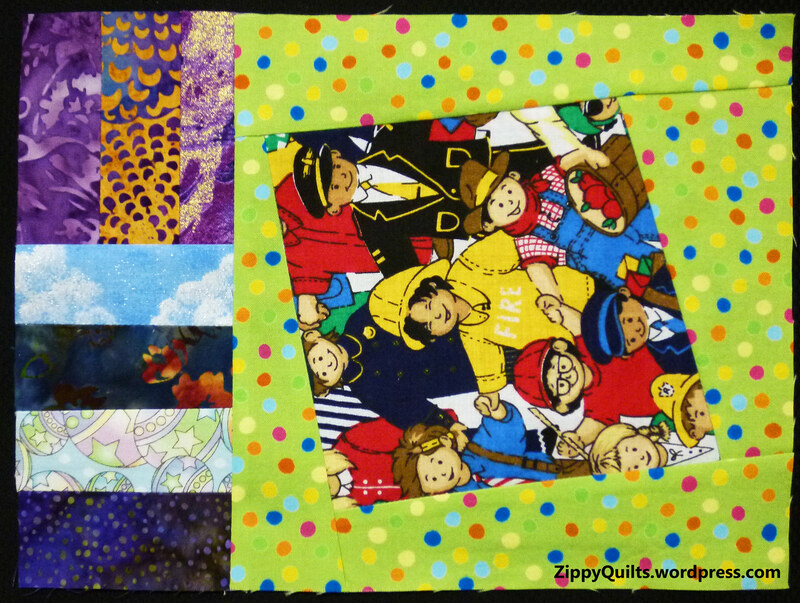 Here are 7 of my favorite ways to make quilting easier/more fun/more efficient. Please add yours in the comments so we can all share! 1. If you agree to make a quilt for someone else, stipulate that you must choose the pattern, or give them 3 patterns to choose from. Non-quilters often have no idea what is involved in making a quilt, and of course have no way to know what type of quilt you enjoy making. I made the quilt at left for somebody else, and it was FUN! 2. As soon as you’ve finished a quilt top, make the binding. You have the fabric right there, and if you go ahead and make the binding now the fabric won’t get used for another purpose (oops). It’s very encouraging to see the binding ready to go when the quilting is finished! 3. Buy extra basics when you find them on sale, since you’re almost certain to need them. Presently my basics are solid black, solid white or cream, and any purple; but likely yours are different. 4. 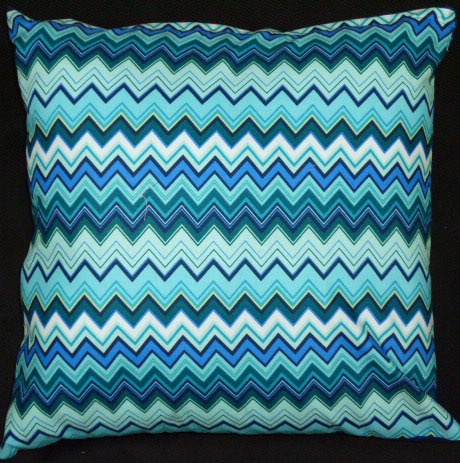 Buy limited amounts of trendy fabrics, even on sale. Chevrons are hot now, but will you want to use the extras 2 years from now, even if you got them on sale? 5. Change your rotary blades when they get dull. Blades certainly are expensive, but your time, energy, and patience are priceless, and they surely are wasted by dull rotary blades! 6. Buy the biggest rotary cutting mat you can afford, and ask for a bigger one (or a second big one) as a birthday present. Cutting is so much easier when you have plenty of room. Now, go quilt and have fun!